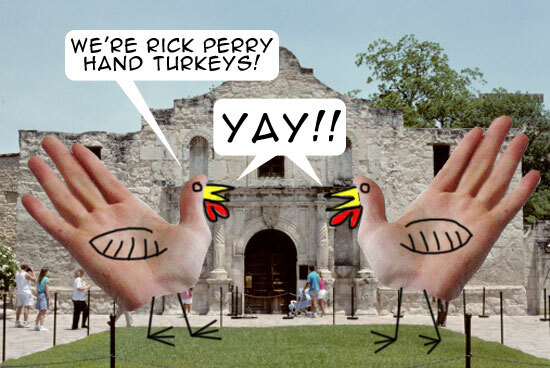 Princess Sparkle Pony's Photo Blog: Rick Perry Hand Turkeys! UPDATE: Vindication! 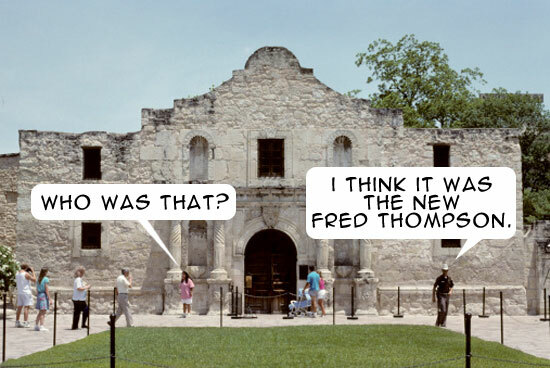 Talking Points Memo referred to Rick Perry today as "Fred Thompson-eque." I can't find the link now, though. I'm not sure he's the new Fred Thompson, either. 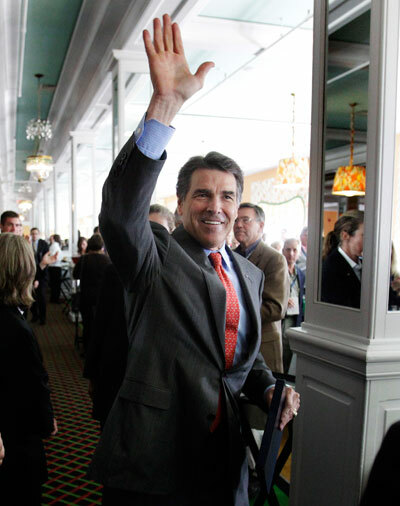 Once he actually entered, Thompson was a polling dud, while Perry is now a front-runner. GOP strategist Alex Castellanos has my favorite Rick Perry analogy so far, when he said on Meet The Press in August: "Sarah Palin with a skirt." I'm excited to see that Perry's pan has flashed. You saw this before most of the rest of us, Peter, and for that you deserve applause. Perry's rainbow striped thong is about to be exposed. 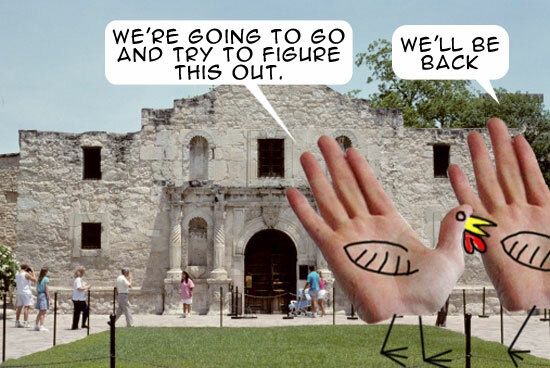 Diane: think "famous Texas landmark associated with failure and loss." Hmm, het gets an "incredible hairdos" tag? I haven't really noticed what I took to be a generic Republican coif. Must study this in more depth . 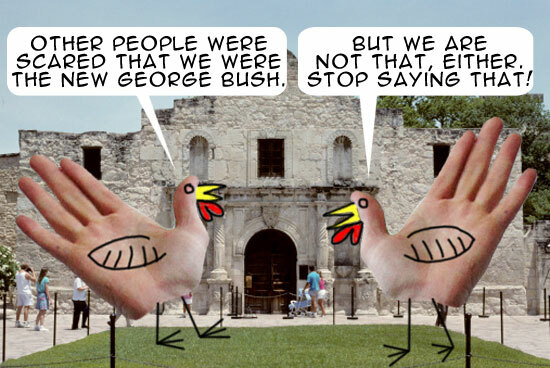 . .
Ha ha, I don't have a "Rick Perry" tag because I've really been striving to not have millions of different tags. I only recently, for instance, added a "Michele Bachmann" tag. So I was thinking, "Do I need a Rick Perry category?" I decided against it, as I'm unlikely to write about him very much, and that the "incredible hairdos" tag would suffice. 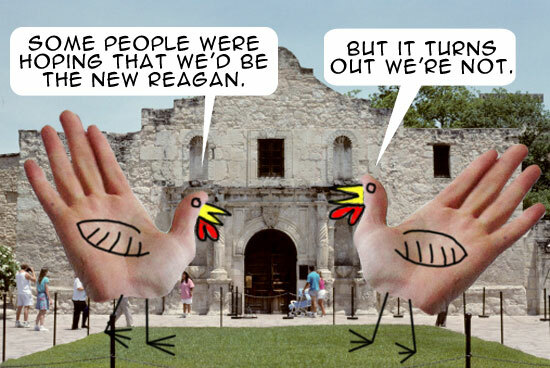 Yeah, you probably don't need a Rick Perry tag because it kinda looks like his turkey has been, um, cooked. 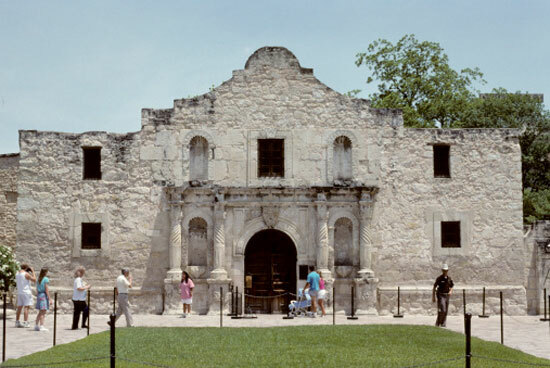 Isn't that the building that Ozzy got kicked out of Texas for peeing on while wearing an evening gown? It's the building whose basement Pee Wee's bicycle is hidden. Duh. Christopher.... Darn it, you beat me to the Pee Wee joke. "Everyone has a Big But." Perry:"I'm pro-life, But... But I like to kill convicted convicts." 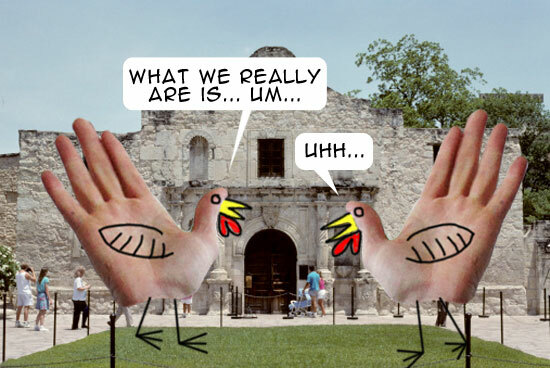 Perry: "I'm pro-life, But.. My idea of gun control is a two handed stance."